Earlier this week I received a sample of Nergia energy. This is a new energy supplement that comes in a glass bottle and can be used for a quick shot of energy. I don’t normally use this type of energy supplement in my everyday life because I prefer coffee as my caffeine source. However, I do keep energy “shot” type supplements similar to Nergia in my car for times when I’m really tired and need to stay awake and alert like when I am driving to the mountains to go snowboarding. When I am driving long distances like that, energy supplements are essentials and I always keep them on hand in the center console of my car. 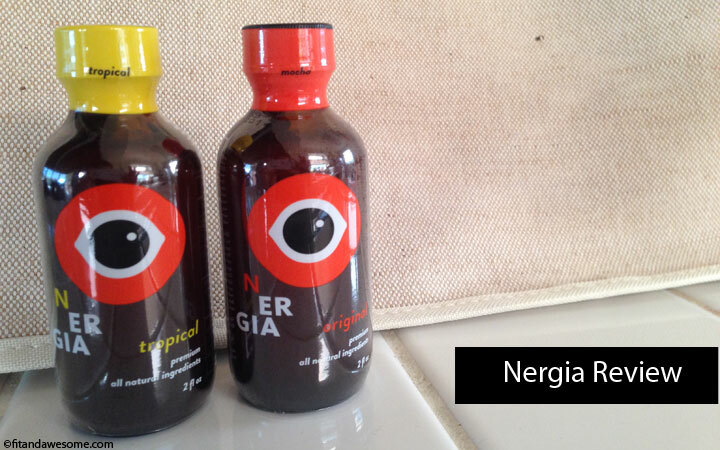 I received Nergia in two different flavors – Original and Tropical. I decided to try the Tropical one because I thought it might be the better tasting option. I took a swig of half a bottle (the recommended serving) in replace of my morning coffee for review purposes. I was tired and wanted to see if the Nergia energy supplement would perk me up. The first thing I noticed about Nergia was the color. It comes in a brown glass bottle and was a brownish color. It seemed weird until I tried it. The product was not sugary at all. I really liked this because I don’t like how much sugar is normally packed into energy drinks and shots similar to this. I looked on the back of the bottle and there is only 1 gram of sugar in the entire bottle. No wonder. If you like sugar, you may not like this because it’s not very sweet. But for me that was a huge plus. Nergia contains about 180 mg of caffeine per bottle. The average cup of coffee has 160mg of caffeine. Did I feel a difference after taking this product? Within about 10 minutes I did feel more alert. I’m not entirely certain I could pinpoint it to the Nergia, but I also did not feel gross or jittery either. I only consumed about 90 mg of caffeine so I shouldn’t have noticed a huge difference anyway. People who are sensitive to caffeine should be careful about this type of product as they recommended you should not consume more than 2 bottles of Nergia a day. The entire bottle is also only 14 calories so the 1/2 bottle serving size is only 7 to 10 calories depending on the flavor you have. Overall I liked trying out this product. While I do not use products like this everyday, I do think it’s something I would keep in my car for long drives when I need an energy boost. The only concern I have is about keeping a glass bottle in my car but I also wonder if the product is in a glass bottle for a reason. Nergia is a new product and is only currently available at certain GNC locations in New York City. If you are interested in learning more about the product you can visit their website for more information. Enjoy! What about you? Do you take energy shots / supplements? Would you try Nergia? Post in the comments and let me know. Flavors sound tasty. If I need a pick-me-up I may have an afternoon cup of coffee. A grad school classmate of mine always said an apple would give her an energy boost…she’d eat them during PM classes. Maybe it was the crunching or just the activity! Good to know! Mocha flavor? Nice. But it’s the stevia that keeps me away – I can’t take the taste and aftertaste. Even though I’m health-conscious, I’d still prefer cane sugar over stevia. In general, I don’t take energy shots. A cup of iced coffee usually gets me through the day; I try to limit my coffee intake to once a day.